Stilettos, baby. Argh I love to look at them. I don't care how expensive they are. I don't care how outrageous. 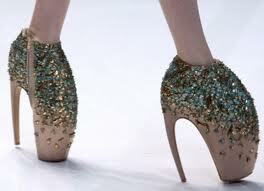 I don't care if I can't walk in them. I don't freakin' CARE. Let me just stare. Prada's beautiful sky-scraper hight Stilettos. Just. yes. But ouch. Yet she still looks fierce? It's the shoes. 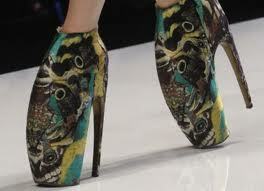 As always, Taking it to the extreme - Alexander McQueen.